Fresh from its complete remake last year, Chevrolet's Tahoe SUV for 2016 raises the bar on family transportation, offering big features, big power and big luxury. While the newest Tahoe may lead all competitors, it also carries a hefty price tag that is likely to leave some families with sticker shock. 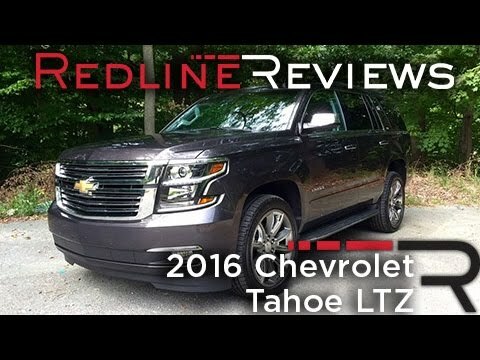 The 2016 Chevrolet Tahoe is a very roomy and comfortable SUV. We seat 9 comfortable and have taken a road trip with 5 people including luggage. It is good on the highway. I would take it in for routine service as indicated by Chevy. We have had some minor issues but I am sure it is due to wear and tear. It is our primary vehicle and we travel on the highway a lot. If you are looking for a good family truck for older kids, this is your truck. If you have younger kids and take road trips, portable devices are needed. What would make our vehicle super nice is tv/DVD player. Rear air controls makes it nice to control the temperature. If there are nine people taking a road trip, space will be limited for luggage. Also, third row will hold the smaller passengers. There are some nifty secret areas to store documents, glasses or anything that you would like to keep from the children. The vehicle is pretty good on gas while on a road trip. If you drive a lot within the city, the gas mileage is not so good and you could be filling up three times a week. If you are back and forth to work, kids) activities, running errands or just hanging out a day or two, filling up will become routine. We have had the truck for almost a year now and haven't had any major breakdowns or issues. The only thing that is a bother is the tire monitor system. It is good when it functions properly but we have had technical issues. I would say, overall the Tahoe is great. I would buy it all over again. Hope this helps! Tahoe and toddlers, a great car for families. The leather seats hold up well to messy toddlers, easy wipe down. The carpet in the rear is hard to vacuum, it holds onto grass and fur; but the carpet of the seating areas vacuums and cleans easily. I wish there was a way the two bucket seats in the middle could fold down lower, giving more room. The entertainment center has a good picture and its nice to have the wireless headphones included so I do not have to listen to kid movies repeatedly. The center bucket seats are easy to buckle child seats into, the seat leaning back feature allows for a tighter fit with the car seat. Front seats are comfortable for long drives, lumbar support helps on vacation drives. The touch screen is helpful but I find I use it only while I am parked; I use the buttons on the steering wheel and the knobs while driving as I can make changes without looking away from the road. I wish the phone Charger was comparable with my iPhone without having to purchase an extra piece to charge my phone. Overall the Tahoe drives nice and smooth. I have enjoyed driving it and I feel safe with my kids in the car. Had a wreck a year after we purchased the vehicle, seemed like it was easy to get the replacement parts to have it fixed, had my car back in a couple days. I feel like it has plenty of room but still fits lengthwise in my standard garage, this was very important to me. Living in a salty coastal area I worry about rust and salt and sand damage. I have no visible signs of rust. Overall the Chevy Tahoe is a very spacious, reliable and luxurious vehicle. I love my Chevy Tahoe. The leather and interior color and fabric is amazing. I love the bucket seats in the middle and I love how the very back seats fold all the way down instead for having to be pulled completely pulled out. The color of my Tahoe is black and I love that as well. The only thing I wish it would have come with is a luggage rack on top. When all the seats are up there is not very much room in the very back so it would be nice if there was a luggage rack. The center console is very large and has a light in it as well making finding things at night or in the dark much easier. Overall I love my Tahoe so much.